AIA Austin Women in Architecture. We will have box lunches sponsored by Ion Art, a speaker from Ion Art on the exhibit fabrication, and a docent lead tour of the Shaping the Conversation Exhibit Series. Event will begin at Noon at 249 W 2nd Street Austin, TX. Parking is recommended at City Hall. Please plan to arrive by 11:45AM. Enjoy a Jason's Deli Sandwhich Box (options selected during registration) until our speaker begins. Kyle Beck project managed the fabrication and installation of the exhibit and will share how collaboration and problem solving can make great projects. Organized and produced by AIA Austin to recognize the far-reaching achievements of women architects in Texas and beyond. Come enjoy a personal docent guided tour of the exhibit to wrap up the event. Hoping to see a Full House to this limited seating event next week. Please plan to arrive around 11:45 AM and enjoy a special lunch! Registration closes at 9AM Monday, February 27th. Happy new year and welcome to 2017! We are gearing up for an exciting year! By now, you may have heard about your new Chapter Co-Chairs, Frauke Bartels and Grady Brown, and they are excited about this opportunity to serve. We would like to tell you about our first Chapter event for the year! This will be a "Limited Attendees" event at the Austin Blanton Museum of Art where the traveling Andy Warhol exhibit is currently under way! Be sure to be one of the first 20 to Register to ensure a spot at this unique event. Parking is in the Brazos Garage, adjacent to the museum's main Michener Gallery building, and will cost $4.00 with a discount if attendees bring their parking tickets into the museum and pay there. Enjoy a slice of pizza and a glass of beer or wine from the Blanton Cafe (In the Edgar A. Smith building.) Mingle with members and enjoy some experimental music in the atrium until our speaker begins. Hite Board Room in the Michener building. 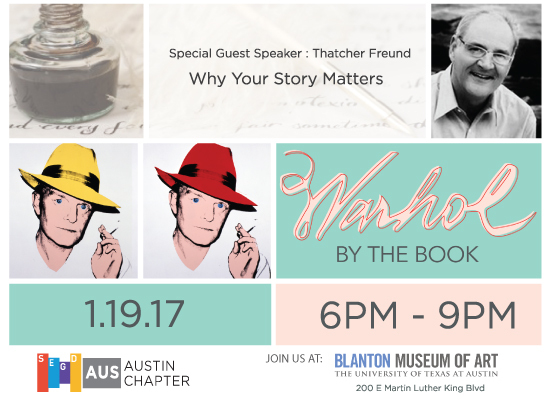 Author and special guest speaker, Thatcher Freund, is a journalist and memoir writer, who will speak of the importance of stories in our lives both to ourselves and to the culture we live in, and why it matters so much that we preserve them. Thatcher is a graduate of Stanford University with a B.A. in History, and a Masters in Journalism from Columbia University, and was born and raised in Austin, Texas. His published work includes The Python Trail: An Immigrant’s Path from Cameroon to America, and Objects of Desire: The Lives of Antiques and Those Who Pursue Them, which follows the lives of three pieces of American furniture from their creations in the 18th century to their sales at Sotheby’s 250 years later. Besides his speaking engagements, Thatcher helps people to write their own memoirs and teaches workshops on memoir writing. Come learn Why Your Story Matters. Come enjoy a personal docent guided tour of the exhibit to wrap up the evening. Hoping to see a Full House to this limited seating event in a couple weeks. Please plan to arrive around 6PM and enjoy a full evening! To attend this exclusive "limited attendee" event, please contact the Chapter Chair at [email protected] to obtain access to tickets. Time to reconnect and visit, discuss some of the goings-on at SEGD and the Austin Chapter. Bar tab picked up by sponsor, SNA. Note: we've rescheduled this event for Mon., Nov. 9 at 6:00 pm. Attend this event to learn about current public art trends like the Venice Biennale 2015 and New York City Summer 2015 temporary projects, some of the projects now being planned by the City of Austin's Art in Public Places program, and ways for artists and designers to get involved in public art, including open calls to artists. We'll also do a short walking tour of public art installations in the area. Sue Lambe, Austin Art in Public Places project manager, will be providing the presentation and guiding the walking tour. Join us and other local artists and designers afterwards at Cedar Door (201 Brazos St.) for a brief social. We have invited Sue Lambe of Austin's Art in Public Places (AIPP) program to give a presentation on the global trends in public art as well as an overview on the AIPP program. This will be followed by a guided walking tour that will feature various public works of art. We will meet on the first floor of the City Hall (room 1101) at 5:30 pm, where we will provide snacks and drinks. We'll get started at 6 pm sharp. There is parking available under the City Hall. After the presentation and walking tour, please join us for some socializing and/or drinks (place TBD).